Here at Motorparks, we are thrilled to be able to take orders for the new Citroën C4 SpaceTourer - an innovative family car which impresses no matter if you're viewing it from the outside or while sitting in its spacious cabin. Citroën has also been sure to pack this family car with an abundance of driver assistance and safety features, while its Connected Nav system makes it so simple to get from A to B and provide all the in-car entertainment you need during a journey. The new Citroën C4 SpaceTourer with new levels of comfort and versatility is available now from Motorparks Citroën and Oldham Motors Citroën. Exceptional engines are available for the new Citroën C4 SpaceTourer, including a PureTech petrol engine which won the 2018 International Engine of the Year award within its category. You can also select to have the family car designed with an EAT8 (Efficient Automatic Transmission 8) gearbox, which works to optimise every gear change to reduce fuel consumption, cut CO2 emissions and deliver high levels of comfort. An elegant exterior design allows the new Citroën C4 SpaceTourer to catch the eye wherever you drive it. Meanwhile, its cabin is amazingly spacious and styled with comfort in mind. What will be the first element of the new C4 SpaceTourer's exterior to grab your attention? Perhaps it will be the dynamic lines etched into the car's bodywork to give it a bold design, or maybe it will instead be its unmistakable light signature.The use of 3D effect rear lights will be sure to draw your eye as well, not to mention its set of sporty and stylish 17-inch alloy wheels. There's more to be impressed about with the new C4 SpaceTourer when you head into its cabin. After all, this is an interior that has been elegantly designed and then beautifully trimmed to encourage the driver and passengers to relax and enjoy any road trip that they are heading on. Everyone and everything is ready to be accommodated for inside this family car as well. In fact, its second row of seats can be folded quickly if you wish to create a flat loadspace that is free of any clutter. When these seats are upright, there's also huge amounts of legroom for every passenger to appreciate. After a family car that's packed with handy and state-of-the-art technology? Look no further than the new Citroën C4 SpaceTourer. Citroën Connect Nav, Connect Box and Mirror Screen are three on-board pieces of equipment which are in place to make all road trips easier to navigate. A hands-free tailgate makes it incredibly simple to load and unload items from the boot too, while 15 driver assistance systems will be working to keep you safe during your entire journey from A to B. 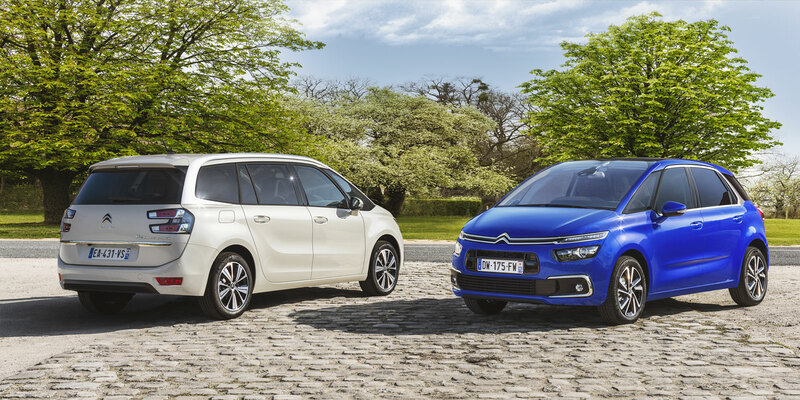 If you're eager to make the new Citroën C4 SpaceTourer your next set of wheels, the next decision you'll have to make is to choose between three equally impressive trim levels - the Touch Edition, the Feel model and the Flair variant. Get in touch with us online to find out more about all the ways the new C4 SpaceTourer can be personalised. You can also get a closer look at this family car by dropping by our Oldham Citroën dealership in Greater Manchester.